With Turbo starting the new tone for the series, In Space takes to that and crafts a very well executed story. The same can be said of Lost Galaxy. While In Space takes previous elements from the past and fuses them with new, Lost Galaxy takes a completely new setting, and in fact a new concept for the world the Rangers inhabit. Let's start this off with Power Rangers In Space. From out of Nowhere is a strong opening, starting with a meeting of evil forces from past seasons, and introducing the new villains. A spy is among them - a Red Ranger. Astronema is chosen by Dark Specter to hunt the spy down. TJ, Cassie, Carlos, and Ashley are still travelling in the shuttle from Earth, and are taken into a larger ship. As the four look around, wondering who this ship belongs to, the Red Ranger is returning, under fire from Astronema. The feeling is a serious tone, and already this episode is setting up the conflict, as when the Red Ranger runs into the four others on his ship, his first thought is to fight them. It takes a bit of convincing they aren't the enemy, and Andros reveals himself as the Red Ranger. The Megaship crashes down on a planet, and during repairs Andros makes it quite clear he wants no help. The interactions are believable, and it takes a lot of convincing for Andros to go accept their help. Alpha is the one who gets through to him, and the other four have been caught by Astronema, who Andros had left on the planet with their shuttle. They're about to be destroyed, but the Astro Megaship flies in, and as Astronema's forces recover, Andros lands it and hands the others their new morphers. Fighting on the ground complete, the Megaship is revealed to have a Megazord mode. After the space fight, it is clear the Megaship is still in need of repairs, so a course is set for Earth. For me, this was the strongest opening yet, and the best transition from one season to the next of the same storyline. It sets the tone at serious while still managing to not take it too far. It still offers lighter moments, and as said, the two-part opener sets up the conflict, as well as introducing the new elements in a natural way. The next episode sets up what Bulk and Skull are doing this season, and that is hunting for aliens with an odd scientist called Professor Phenomenus. Bulk and Skull had spotted Astronema's ship - the Dark Fortress - while star-gazing, and so wanted a professional in the field. On that ship, Elgar has been assigned to help Astronema by Dark Specter. Of course, the episode after has a team up with the Ninja Turtles, which was a fun episode. The Turtles trick the Rangers into getting them on-board the Megaship, and Astronema's forces jump ship to do battle with the Rangers, with the Turtles helping under her spell. Another episode sets up the main quest of Andros, and that is finidng his sister, Karone, after she had been captured when they were both young. The quest for Zordon is still active, and the Phantom Ranger has found him. Guarded by Divatox's forces. Astronema's forces come in to help as the other Rangers reinforce Phantom. Just like in Turbo, the Phantom Ranger has access to a new Megazord, which he grants to the Rangers. The Delta Megazord joins the battle, though they are no nearer to rescuing Zordon. The next few episodes are great at giving some new situations, such as an insect monster who can sting a subject and turn them into a monster as well, or a grandma driving a police car into a monster to help the Rangers. The episodes also set up Darkonda, the one who captured Andros' sister, as well as him having a history with Ecliptor. The two get into fights with each other and try to one-up the other. It's a decent bit of in-fighting that shows the history of these two, which goes further when Ecliptor tries to poison Darkonda with a power-up potion. Andros is undercover again, and gets into a game of cards in a casino where Darkonda is hanging. The planet is based on wild west architecture, so the place is more a saloon. One of the other players has some key cards that belonged to Zordon, and he bets them. Andros wins them, but trades them with Darkonda for information. Before Darkonda reveals too much he realises who the man in the cloak is. Andros and Darkonda do battle, and Andros makes his escape with the key cards. 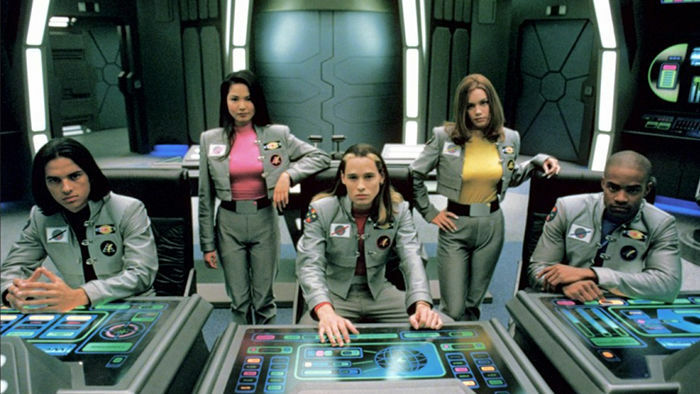 Those key cards grant access to the Mega Voyager. With Darkonda now back on Earth in supersize form and destroying the city - having taken the power-up potion and gone beserk - the Rangers have trouble fighting him off, even with the Astro Delta Megazord. Splitting the two and leaving Alpha in charge of the Astro Megazord, the Rangers head into space to claim the Mega Voyager. All looks lost as the Astro Megazord loses all power, but the Rangers bring the Mega Voyager to Earth and destroy Darkonda. The episodes themselves are tense, though fun where they have to be. A good story is told, giving a bit more history into the world. The only thing that spoils the otherwise good arc is the ending. The Astro Megaship is still in need of repairs, it looks to be out of action. Astronema knows this and even says they should attack while the Rangers are weak. Nothing ever happens with that, though the next episode itself is the first of the team-up episodes. Piranhatrons are hauling the Lightning Cruiser and Storm Blaster across a desert, and the two work together to free each other. Storm Blaster gets away and heads to Earth. Divatox alerts Astronema, which sets in motion the recapture. Storm Blaster has tracked down Justin, Turbo Blue, in the night. Astronema tried to capture it, but the Rangers intervened, though they were captured. Justin comes to the rescue, meets his friends again, and the group head out to rescue Lightning Cruiser. It's a good bit of continuation of Justin's story, and one last time to see the second Turbo group together. Storm Blaster gives Justin the Turbo Blue powers, though previously the powers were destroyed. I can only guess the powers were restored to their original form, as what happens with other powers that get destroyed. This also marks the first time the Once a Ranger line is spoken, which becomes an actual episode title in Operation Overdrive - which also featured previous Rangers returning with restored powers. Zhane's introduction is a smooth paced episode, with the Rangers finding the stasis tube he is in, and Andros giving the needed exposition. The two were best friends, always fighting together. Zhane was seriously injured protecting Andros, and so was placed in the stasis tube to preserve his life. When danger hits the Astro Megaship and the healing chamber the stasis tube lies in loses power [and no, I am not getting into all the other times the entire ship has lost power]. It looks as though the last bit of life in Zhane has gone, but no. He has survived and joins the Rangers in battle. It's touching when Andros feels the life gone from his friend, and his reaction against those he fights feels natural enough. Future episodes show Zhane's powers need a bit of boosting before they are fully recovered, which is also handled well. I like to think it was Zhane who started Astronema down the road to remembering who she was, as he was the first to be properly nice to her since her capture. She accidentally attacks a monster, who returns fire upon her. Zhane takes her away from the fight to care for her. The two start thinking of each other, and Astronema sends an anonymous note to Zhane. The monster has returned, delaying Zhane meeting her. When the two do meet up, Astronema reacts badly, saying she thought he really cared and disappearing. But still she can't help but think about him, as he does her. The next few episodes deal with Astronema slowly coming around to the side of good. When the Rangers explore a planet, they run into former inhabitants of KO-35. Those inhabitants are forming a resistance against Dark Specter, who has found out. At first a disguised Darkonda is successful in convincing those inhabitants this batch of Rangers are troublesome, but when Andros and Zhane arrive, the truth comes out. Zhane decides to stay with those of KO-35, but promises to return. Adam returns to give a bit of guidance to Carlos when he needs it, as after mistakenly attacking Cassie he is ready to give up being a Ranger. Adam teaches him that sometimes you just have to take a chance to win. Again, powers that were supposedly destroyed are used again, but since the morpher hasn't been repaired, those powers are unstable, as shown in the episode. And now Astronema really starts to remember who she really is. Both Andros and Karone had a locket with both their pictures inside. That is the reveal of Astronema being Karone. Darkonda had tried to get rid of Andros, but Ecliptor stepped in to save him. So Astronema finally gets into the action and fights. The locket is cut from her, and when questioned, Andros finally realises. Astronema at first blocks the fact, but keeps on thinking, comes around, and decides to help the Rangers locate Zordon. I've said it quite often, but this series really has some powerful scenes in it, and the distrust the others have when Andros brings Karone on-board the ship is one of them. The entire episode of The Rangers' Leap of Faith keeps the audience on edge, as it hides where Karone's loyalty lies until the very end. The fact is though, her information on where Zordon was located was true, but he had already been moved again. Dark Specter didn't trust her, and it's possible Zordon was never even at that location. As Karone gets comfy being with her brother and the Rangers, Dark Specter gets his revenge. First converting Ecliptor back to being evil, then setting an asteroid on Earth. Karone decides the best way to get rid of it is reprogram it from the Dark Fortress. She is captured and brainwashed, and when Andros and Zhane go to rescue her and see that, Andros is feeling pretty hurt. But not as much as the entire team does when the Psycho Rangers come to town. Astronema has a double purpose now. She is using the Psycho Rangers to both drain Dark Specter of his powers and destroy the Rangers. However, the Psycho's are fighting among each other, and don't trust Astronema. When Pink and Blue get destroyed, and Dark Specter starts to feel his powers draining, Astronema puts a new plan into action. Final efforts are made, with the rest of the Psycho Rangers destroyed. Dark Specter rallies all forces, and it looks like evil will win. With his final life, Darkonda takes out Dark Specter, putting Astronema in charge of the entire forces of evil. The finale is strong, with the right tone giving the best end of the world feel. With time up, Astronema is ready to destroy the Earth, but the people rise up. The Rangers reveal themselves to their people, and everyone fights. Andros is already on the Dark Fortress, and has a great decision to make. The only way to win is to take Zordon out. When Astronema joins him, and the two fight, Andros accidentally takes out his sister. Ecliptor sees this, and both have strong feelings which are felt in that moment. After he had hesitated the first time, Andros finally does his duty and shatters the tube holding Zordon. All evil is wiped out, with those turned to evil returning to their true form. The energy also restores Karone to her normal self. Celebrations are had, and the Rangers are helping with the reconstruction efforts of KO-35. While Andros at first says he is staying behind - and that loss is felt most by Ashley, who had come to develop feelings for him - he joins them with Karone and Zhane, and happily the crew set course for Earth. Lost Galaxy for me felt confused on a tone at first. It felt like it wanted to be a more light-hearted adventure while at the same time be just as serious as In Space. We open on the planet Mirinoi, where the story of the Quasar Sabers is being told. Maya is among the group listening in, though the story gets interrupted by Furio. He wants the sabers, and starts attacking the village. Kendrix, Kai, and Mike are on military training before the colony of Terra Venture heads out on its voyage. Leo - brother of Mike - is also a part of the training, though he isn't meant to be. He wasn't allowed to be on Terra Venture, so used a military uniform to sneak around and gets drafted into the group. On the exercise, Maya runs into the four through the portal, hurt. Some Stingwingers also followed, and the four fight them off. Maya explains her situation, and Mike and Kendrix decide to help. Kai is meant to take Leo back, but as Leo had run off through the portal, Kai just leaves. He feels bad about doing so, and seeing a flyer for the Astro Megaship museum, decides to take it through the portal, with the help of mechanic Damon. Alpha and DECA are still around, and effectively play the same role as In Space. Bulk, Skull, and Professor Phenomenus also cameo, with Skull having been left behind since the other two forgot to wake him before they boarded Terra Venture. As I said before, the tone seems confused, and during a touching scene between Mike and Leo, that is evident. Furio has opened up a chasm in which Mike fell into. As Leo tries to rescue him, Mike hands the quasar saber to Leo, and lets go. It is a nice scene, but to me at least, felt as though it was cycling through serious and light tones rapidly. The quasar sabers are what give the new Rangers their powers, and while Mirinoi is frozen in stone, they now have the power to protect Terra Venture. The third episode shows how the Rangers get their zords - the Galactabeasts. The beasts are captured and chained, and has impact in how it's handled. Of course... Elvis Monster, as I call him. Any impact the episode had is pretty much lost whenever this monster says anything. The later episodes also feel confused on tone, but it gets quickly corrected and the overall feel of the season is a more serious tone - especially when the Magna Defender is introduced. A quick run through the evil side for the season, the main bad is Scorpius. He is the leader, and orders others around. He has a daughter - Trakeena - who isn't much of a fighter but wants her father's approval, as he is too protective of her. Generals include Furio, Treacheron, and Deviot. Magna Defender wants revenge on Scorpius for the death of his son. In his quest for vengeance, he battled against the Rangers, and when the Lights of Orion enter the picture, Magna Defender wants them as part of his plan to destroy Scorpius. Furio loses it after numerous failed attempts to get the Lights, and attacks Leo, hoping to self-destruct and take the source of his problems out with him. Leo survives and Furio is no more. The Lights have chosen the Rangers, and give them a new powered-up form. They can only be activated when all Rangers use them together, something which Treacheron uses to his advantage when he injures Leo. During the episode, Trakeena gets caught up in a fight, after making out Treacheron was a traitor. The Rangers interrupt that fight, but Trakeena runs into Magna Defender, who wants to take her life in his act of vengeance against Scorpius. He hesitates, as though something is holding him back [and whenever this happens we hear a heart beat], and Trakeena scarpers, vowing to get stronger. Scorpius decides to drain Terra Venture of its power, and in doing so makes one of the domes unstable. The Rangers must stabilise it before it blows. The story of Magna Defender comes to an end, as he lets his hatred go and sacrifices himself to stop the destruction of Terra Venture. It seems Leo was right in a way though, as Mike was inside Magna Defender, who had also been thrown into the chasm on Mirinoi. He had saved Mike from hitting the floor, and used his life force to strengthen himself to escape. The Rangers' rescue of Magna Defender made him see helping the cause of the Rangers was the best thing to do. With Mike released and now back within Terra Venture's command, Magna Defender as a person passes his powers to Mike, who then becomes the Magna Defender. Now, there's an episode just before the Rangers get new zords that is very interesting indeed. Trakeena wants to keep her beauty and rebels against her father, who wants her to complete the transformation. But that isn't the interesting episode. The Rescue Mission is. And it's interesting because while the Rangers feature in suits, they are pretty much secondary to the episode. Terra Venture answers a distress signal, with Mike and Leo fronting a team of soldiers. Within the ship that sent the distress signal, a monster waits. However, it plays out more like a Doctor Who episode than Power Rangers, with the group looking around the deserted ship, and the team disappearing by this unknown monster. Mike and Leo are the only ones left, and rescue the others from the webs they have been stored in. The other Rangers appear suited, but only to help the soldiers get back to their own ship. Mike and Leo fight off the monster with military blasters, and when Mike gets caught as he makes the jump between ships, a touching moment as Mike is telling Leo to let go and get away, but Leo won't. The episode ends with Mike and Leo looking at the book they had found on the other ship. That book's first secret is the revelation of three more Galactabeasts. And Deviot has new zords he's playing with. Those zords are powered-up by the Rangers' own energy. And once they are powered-up, they wreck havoc on Terra Venture. The Rangers' own zords won't fight against Deviot's zords, and it is Kendrix that makes the connection. Deviot's zords are the lost Galactabeasts. To me though, there was not much happening within the two-parter. Yes, Maya's connection to the zords is explored a bit, when she asks them why they don't fight, but then at that point it should have been known Deviot had taken control of the lost Galactabeasts, even if they didn't look the same. Deviot is certainly a trickster, as he plans to take out Scorpius and assume control himself. Trakeena is on the planet Onyx, where she comes across Villamax and his aide Kegler. While Trakeena trains to become stronger with their help, Deviot works a story that the Rangers have captured Trakeena, leading Scorpius down to Terra Venture. Deviot tricks the Rangers into heading to where Scorpius is, and Leo delivers the final blow on Scorpius which activates Deviot's explosives. When Trakeena returns to her father's side, he dies in her arms, having passed leadership to her. Deviot isn't happy about that, so when Trakeena vows revenge, he plays double duty by pretending to help while at the same time trying to destroy Trakeena. This is the point, I feel, in which Lost Galaxy is starting to get deeper into its story, giving some real impact within the world its characters live. And in the last half of the season, that really shows. The Rangers go through some more character tests, as relationships are put in question and made stronger. These tests help to strengthen the team and each individual, and work up to one of their greatest challenges yet. The Psycho Rangers. Deviot uncovers them and controls them, pitting them against the Rangers - four of which are easily captured. Leo takes a stand against Psycho Red, and when it looks like he's about to get captured, a cloaked figure rushes in and stuns Psycho Red. The cloaked figure is Andros, who returns with Leo to the Astro Megaship and is reunited with Alpha. Unlocking the vault where the astro morphers are, he takes his own, and Leo and Andros - along with Mike - head out to rescue the other Rangers. With Leo and Andros on distraction, Mike takes out the holding cell, and the other Rangers are freed. And four more Rangers come into the mix. 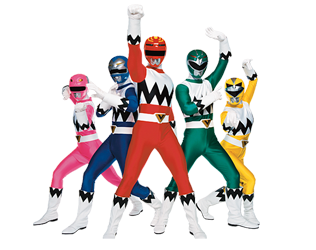 Ten Rangers and Magna Defender face off against Trakeena's forces and the Psycho Rangers. With the Psycho's destroyed, the Space Rangers and Galaxy Rangers mingle with each, with a tour of Terra Venture underway. Psycho Pink survived, and goes against Deviot's control to take out both Pink Rangers. On a nearby planet, the Savage Sword is found by Psycho Pink. Cassie and Kendrix do their best, but Cassie is separated from her morpher, and with the Savage Sword struck into it, Psycho Pink gets a massive power surge, transforming into a huge monster. With the Astro Megazord and Galaxy Megazord fighting the monster off, Kendrix makes a decision. With dark energy surging throughout the galaxy, Kendrix gets inside the vortex and destroys the Savage Sword. Cassie's power is returned to her, but Kendrix is no more. In a very touching final scene, all the Rangers mourn on the loss, wondering what they will do now. The Pink Quasar Saber is picked up by Karone, where it had fallen to an auction house on Onyx, by disguising herself as Astronema. Trakeena ruined that ruse, and takes the saber. With strength from Kendrix, Karone manages to overcome Trakeena and take her place as the new Pink Ranger to the team. Though she still has some dealing to do with her past. I feel it definitely was right to make Karone the replacement for Kendrix, as we get to see her dealing with her past - something that really couldn't be explored with In Space. Terra Venture enters the Lost Galaxy, and... It started on a strong episode, with Captain Mutiny tricking everyone into believing he was good, getting them to unknowingly transfer a monster that would damage Terra Venture. The Rangers found out what was really happening, and just a second too late arrive to see the monster head into the superstructure. Once that monster is defeated, we get an episode that looks back at the season, an episode that takes place in a dream, and an episode that has the Rangers facing off against past monsters. Those three have a few good character interactions, though seem more focused on showing how the team has grown rather than advancing the story. The only real plot point we get is that Terra Venture's fuel has been tainted. They only have one or two days before Terra Venture shuts down for good. With the need to find a new home now urgent, the plan is to get out of the Lost Galaxy as quickly as possible. And things get real. The engines of Terra Venture are failing, and as Leo and Kai figure out the secret spell of the Galaxy Book to get out of the Lost Galaxy, Mike has gone undercover to rescue the people taken by Captain Mutiny. With the Rangers and the Megaship waiting to take them away, the portal back to reality is closing. Mike does the only thing neccessary, and sacrifices the Magna Defender powers to keep it open. Back in their own galaxy, those of Terra Venture have come across a new home. However, one last test stands in their way. Trakeena hasn't given up, and with Deviot returning to her, he does the only thing to survive. Dragging Trakeena into the cocoon of power with him, the two fuse together, and Trakeena uses drastic measures to ensure Terra Venture's destruction. Villimax is at odds with this, and tries to make Trakeena see sense. Unable to do so, he refuses to fight and is destroyed. Terra Venture, crashed on the moon of the planet, has now been evacuated, and everyone is on the planet. In a bid to stop Trakeena, the Rangers sacrifice the Megaship, destroying both it and the Scorpion Stinger. In one last bid to make Leo pay for killing her father, Trakeena powers up the broken Terra Venture and intends to take it on a collision course. That gets stopped by Leo, and Trakeena is destroyed for good. It's quite a happy moment to watch the colonists, having come so far in the hope of a new home, celebrate this victory of the Rangers. In a twist of fate, the planet they have landed on is Mirinoi, and with their work now done, the Rangers place their Quasar Sabers back in the rock where they were first drawn. That is the final key to restoring the people and planet from the stone they were placed in. It also enables Kendrix to return. Just like In Space, the tone of the finale was on point, giving the sense of defeat and despair during the final fight. Two seasons both with a space theme, and two seasons that show good storytelling pretty much all throughout. In Space, I feel, is the stronger of the two, as Lost Galaxy shows the strain of its Sentai footage. While In Space was based on a Sentai that used space as a theme, Gingaman - the Sentai Lost Galaxy is based off - is a nature themed series. That, along with some questionable use of Terra Venture as a living place, makes it come off as weaker. Let me just explain that. There is the main dome of Terra Venture, which is the city. Many other domes splinter off from the main one, and these are used as other areas taken from the Sentai footage, such as beaches, oceans, forests. Some episodes seem to swap between domes within the same fights with no real explanation of how that could happen. It's a major case of not trying to explain Rangers logic and make the best of it, so it's not like I'll be making a judgement on it based on that. As such, In Space takes the top spot in this ever growing list of Rangers series. Lost Galaxy takes the second spot, though it is a close call with Mighty Morphin'. The fact the latter ran far too long and felt as if it was reusing concepts with its own characters places it lower. Next up is exploring Lightspeed Rescue and Time Force. I have some experience of Time Force already, having been interested in a few episode arcs and watching them [the same for Once A Ranger of Operation Overdrive], so whether the rest of the season impresses as much is yet to be seen.